What’s up, hot dog? IFC has released the premiere of Comedy Bang! Bang!’s fifth season a week early. 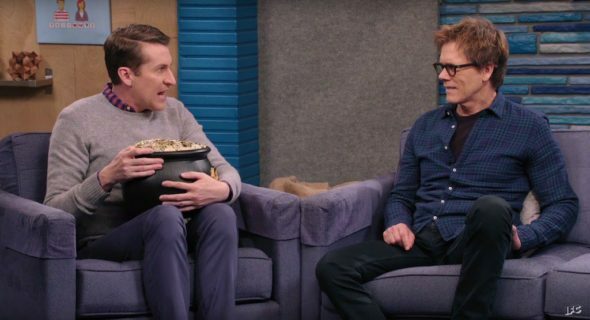 The faux talk show is based on the popular comedy podcast from Scott Aukerman, who hosts the series alongside new bandleader “Weird Al” Yankovic. The season five premiere features guest Kevin Bacon as well as “a special appearance by a very famous actor… Leonardo DiCaprio (Ben Schwartz).” The new season officially begins on June 3rd. But you can watch the entire first episode online now. What do you think? Are you a fan of Comedy Bang! Bang!? Who’s been your favorite guest so far? More about: Comedy Bang! Bang!, Comedy Bang! Bang! : canceled or renewed?, IFC TV shows: canceled or renewed?